Overall: Georgette is very, very BAD!!! Let me stop 🙂 LOL! 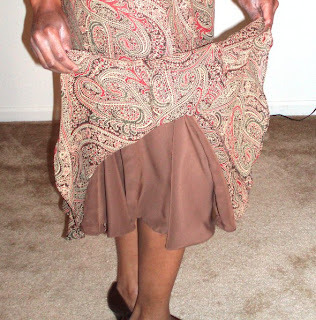 Okay, for starters, this is a very easy skirt to make. What made it difficult was the fact that I used georgette and I added a lining, which was pretty much like making two skirts–double the work. I cut a size 12 with a fourteen in the hips. Making the hips larger was a good move; however, I should have just made the skirt a 14 in the waist too, or just not have taken in the ease the waist. As it happened, the waist on this skirt is very high and very snug. Too snug for comfort. The other curious feature of this pattern is the layout. 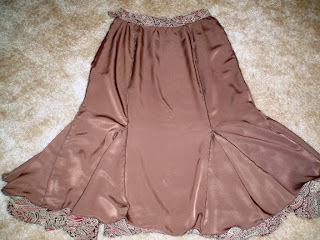 Views C and D, virtually the same skirt (except D has trim on the hem), have different layouts. View D is laid out on the grain of the fabric, and the View C is laid out on the bias. I couldn’t figure out why; maybe View D is laid out on the grain because of the trim. Because of the smaller amount of fabric I had to work with, I laid out the gores on the grain and the godets on the bias. I’m sure this was a bad move, because my godets droop kind of funny at the hem instead of flaring out mermaid-style. Another boo boo I made with this skirt was when I was serged the fashion fabric together, some of the fabric got caught underneath and serged into the seam. I’m surprised at how composed I was after seeing I just about ruined a gorgeous skirt. I had to take out the stitching where the extra fabric was only to reveal a nice little gash in my beautiful georgette. Talk about being heart broken! I did sew up the gash, press the tiny seam, and it’s barely perceptible to the human eye, but there is a tiny pucker where the fix is. Oh well. Oh, and I sewed the waist band on wrong so that the flap for the hook goes back to front instead of front to back. To remedy this, I’ll just wear the skirt with the side closure on the right side instead of the left. This also helps hide the pucker from the fixed gash that was originally in the back. Now the gash is in the front, but it’s even harder to tell in this position. Talk about disappointed. It’s a pretty skirt, but it didn’t come out quite the way I would have hoped. I’ll still rock it though, and it goes perfectly with my McCall’s 5533 top. So there you have it! 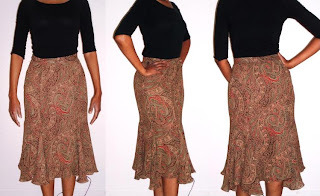 I’m going to make a skirt out of georgette (using a different pattern) and was looking for tips sewing with georgette when I found your blog entry. Kudos to you for finishing the skirt! You were wondering about cutting the skirt on the bias vs. the straight grain. It is most curious that the pattern you used has one view cut on the bias and the other on the straight grain. A fabric guidebook I have states that georgette looks great when cut on the bias – doing so gives a wonderful drape that clings and flares in all the right places. My daughter has a georgette dress (commercially made) with godets; I examined it and noticed that the main skirt is on the bias, while the godets are on the straight grain. I think cutting the godets on the straight grain helps keep them from drooping. Your skirt is lovely . I think it’s well worth the effort of making two skirts. Very flattering on you. I really love your skirt. You are so brave to sew georgette. I have not sewn it in a long, long time. You know why!!! Love the look of this and looks good on you. All I can say is wow!!! I would have thrown it in the trash lol. I have NO patience when it comes to me messing up somthing lol Good for you for toughing it out.